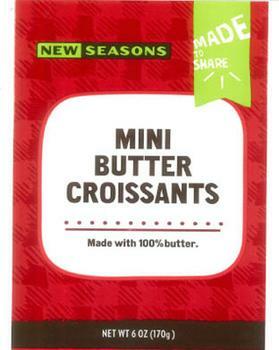 New Seasons Market is recalling New Seasons Market 8-pack mini butter croissants and 8-pack mini chocolate croissants. The products contain egg and soy lecithin, allergens not declared on the label. Customers who purchased the recalled products should dispose of them or return them to the place of purchase for a full refund. Receipts are not required for the return. Consumers with questions may email the company at talktous@newseasonsmarket.com.